Paul Lauterbur obtained a PhD in Chemistry from the University of Pittsburgh. He spent the majority of his career at the State University of New York at Stony Brook and the University of Illinois, Urbana Champaign. He is best known for his work conceiving and developing magnetic resonance imaging which led to the MRI techniques used in medical diagnosis and earned him a 2003 Nobel Prize in Physiology or Medicine with Peter Mansfield. May 6, 1929Birth, Sidney (Ohio). 1951Obtained BS in Chemistry, Case Institute of Technology, Cleveland (Ohio). 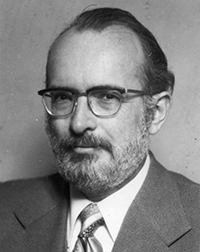 1951 – 1962Researcher, Mellon Institute Laboratories, Dow Corning Corporation, Pittsburgh (Pa.). 1950sTwo years of service Army Chemical Center, United States Army, Edgewood (Harford County, Md.). 1962Obtained PhD in Chemistry, University of Pittsburgh, Pittsburgh (Pa.). 1963 – 1985Professor of Chemistry and Radiology, State University of New York at Stony Brook, Stony Brook (N.Y.). 1969 – 1970Sabbatical at Chemistry department, Stanford University. 1982Awarded Gold Medal, Society of Magnetic Resonance in Medicine. 1984Awarded Albert Lasker Clinical Research Award. 1985 – 1990Professor, College of Medicine at Chicago, University of Illinois, Chicago (Ill.). 1985 – 2007Professor and Director, Biomedical Magnetic Resonance Laboratory, University of Illinois, Urbana-Champaign, Urbana (Ill.). 1986Awarded European Magnetic Resonance Award. 1987Awarded National Medal of Science. 1987Awarded the Gold Medal, Radiological Society of North America. 1992Awarded International Society of Magnetic Resonance in Medicine Award. 1994Awarded the Kyoto Prize for Advanced Technology. 1999Awarded Gold Medal, European Congress of Radiology. 2001Awarded NAS Award for Chemistry in Service to Society, National Academy of Sciences. 2003Awarded Nobel Prize in Physiology or Medicine with Peter Mansfield “for their discoveries concerning magnetic resonance imaging”. March 27, 2007Death, Urbana (Ill.). First wife, married in 1962. Second wife, married in 1984. PhD advisor at University of Pittsburgh. Research assistant to Lauterbur at University of Illinois, Urbana-Champaign. Research collaborator and shares 2003 Nobel Prize "for discoveries concerning magnetic resonance imaging." Advised by Lauterbur at University of Illinois, Urbana-Champaign. Professor of Chemistry and Radiology. Two years of service, Army Chemical Center. Professor and Director, Biomedical Magnetic Resonance Laboratory. Obtained BS in Chemistry (1951). Awarded 1992 International Society of Magnetic Resonance in Medicine Award. Member and awarded 2001 NAS Award for Chemistry in Service to Society. Obtained PhD in Chemistry (1962). Paul C. Lauterbur papers, 1945-2010. Paul C. Lauterbur Nobel Prize biography. Paul Christian Lauterbur Physics Today obituary. Paul Lauterbur - National Academy of Sciences Biographical Memoir.